University and U.S. 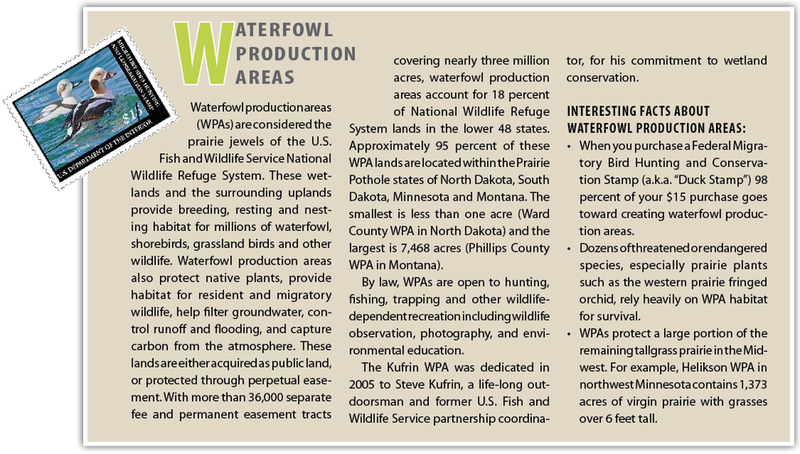 Fish and Wildlife Service Partner to Find Solutions - The Kufrin Waterfowl Production Area (WPA) is the heart of some of the best remaining waterfowl habitat in Minnesota. Located northeast of Ortonville, Minnesota near the South Dakota state line, this 739-acre WPA is part of the Morris Wetland Management District. JB Bright, wildlife refuge specialist for the district is tasked with managing habitat to meet the needs of prairie wildlife. “The goal of the Morris Wetland Management District is to restore and protect wetland and grassland habitat and manage the lands to benefit breeding waterfowl and other wildlife,” explains Bright. “Much of the land that we acquire is former cropland that we need to restore to native grassland species.” In an average year, the district may restore several hundred acres of tilled land back to native grassland species and restore numerous drained wetlands. Restoring these wetlands not only provides habitat for wildlife but also helps prevent downstream flooding and provides sites for public recreation such as hunting and wildlife photography. The study site was located in an 88-acre restoration project that was seeded to native species in June of 2007. When the trials were initiated native perennial grasses such as little bluestem (Schizachrium scoparium), big bluestem (Andropogon gerardii), indian grass (Sorghastrum nutans) and side oats grama (Bouteloua curtipendula) were established on the site. There were also many native forbs including golden Alexander (Zizia aurea), purple prairie clover (Dalea perpurea), wild bergamot (Monarda fistulosa), yarrow (Achillea spp.) and goldenrod (Solidago canadensis and S. rigida). The restored area was mowed in June of 2008 to stop Canada thistle seed production and the research study initiated the following year. Milestone® and Transline® were applied June 25, 2009 when Canada thistle was at the late bolt to bud growth stage. Fall treatments of these herbicides were applied September 23, 2009. The area outside of the herbicide treated and non-treated plots was mowed June 2009, August 2009 and June 2010 to prevent Canada thistle seed production and flight. Four quadrats were randomly established in September 2010 in this mowed area and data were collected to compare the effect of mowing to herbicide treated and non-treated plots. Results of the study to date show that Milestone at 5 fl oz/A and Transline at 10.6 fl oz/A (2/3 pints/acre) applied in September provided greater than 90% control of Canada thistle the season following treatment (Table 1). There was no significant difference in Canada thistle control between September and June applications of Milestone although control was slightly less in June (83%) compared to September (93%). There was a significant difference in control with Transline with the September application providing 90% Canada thistle control compared to 65% when applied in June. There was no significant difference in visual percent cover of forbs based on herbicide application timing. However, forb response in herbicide treated and non-treated plots was significantly different compared to mowed plots (Figure 1). Forbs remaining in herbicide treated plots were larger and more robust across application timing compared to forbs in mowed or non-treated plots (Photo). There was a trend for cover of exotic forbs including sweetclover, perennial sowthistle (Sonchus arvensis), and dandelion (Taraxacum spp.) to be higher with herbicide treatments applied in September compared to June (Photo). Since most vegetation was removed with mowing, this treatment had a significantly higher negative impact on native forb cover compared to herbicide treatments or non-treated plots when evaluated in September 2010 (Figure 1 and Figure 2). Although long term monitoring of the plant community is needed to understand impacts of the various treatments, results of this evaluation indicate that mowing had a greater negative impact on the cover of native forbs than the herbicide treatments. Bright noted that, “Results were very enlightening because native forbs were visually more robust in herbicide treated plots compared to mowed plots. The herbicide treatments greatly reduced competition from Canada thistle and opened a niche for native forbs and grasses to thrive. In mowed plots, Canada thistle is still present and continues to compete with seeded species, impacting our desirable plant community.” Current research results suggest that forb response may be similar with herbicide treatments applied in either June or September. Plant counts were also taken in each of four replicates for each treatment in June using a square yard (yd2) frame. The only forb showing a significant response (P=0.05) to herbicide application timing was purple prairie clover. The June application of Milestone at 5 fl oz/A showed no significant impact on this forb (6 plants/yd2 in treated versus 4 plants/yd2 in non-treated) compared to complete removal of the plant with the September application. There was no significant impact to purple prairie clover with applications of Transline at 10.6 fl oz/A regardless of application timing. These plots will be monitored in 2011 to measure plant community response to various treatments. A secondary benefit of herbicide treatments is that there is less physical disturbance to upland bird habitat compared to mowing. “Our herbicide application equipment treats an area 52 feet wide compared to our mower which is 24 feet, so we have less disturbance and fewer tracks, both of which can impact upland bird habitat. Applying herbicides also saves time compared to mowing,” says Bright. “Our goal is to have diverse native plant communities that will include different levels of canopy cover and structural diversity to serve a wider array of birds, pollinator insects and other wildlife,” explained Bright. Information from this research will help us select native forbs for seeding that are more tolerant to herbicide treatments, and time herbicide applications to achieve the best results.” Restoring a diverse, healthy, native plant community will not only benefit wildlife but will be more resilient to invasion by non-native plants. Some states require an individual be licensed if involved in the recommendation, handling or application of any pesticide. Consult your local extension office for information regarding licensing requirements. State restrictions on the sale and use of Transline apply. Consult the label before purchase or use for full details. Milestone is not registered for sale or use in all states. Contact your state pesticide regulatory agency to determine if a product is registered for sale or use in your state.